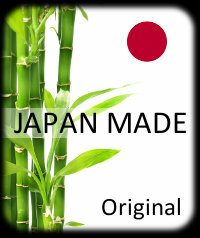 When selecting chisels, the most important point to consider is the kind of material you are going to work on. From your own experience, you probably already know that the harder the stone, the stronger your chisel must be. In fact, the overall efficiency of this workhorse tool is highly dependent on the level of its hardness. Chisels for stone must be "hard" material. Normally, chisels are made of steel, but working with a steel chisel on stone can be both time-consuming and exhausting. A steel chisel is simply not hard enough for stones such as granite and sandstone, so a lot of time and energy goes into cutting and roughing out the stone's surface. Reducing the time spent working with the chisel is good for both the artisan and the stone. Too many strikes sometimes lead to unexpected cracks or the deterioration of the stone. Stones like granite and sandstone are harder than marble and travertine. In Japan, we cut and polish more granite than marble because much of our stone cutting industry is directed towards the production of tombstones, which are made mostly from granite. Given our experience working with the hardest stones, we have strived to set the "standard" for chisels that meet the requirements for high power usage. Our chisels are made with a hard alloy, specifically, a hardened carbide, which is much stronger than steel and can stand up to the hardest stone such as granite. 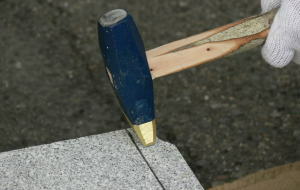 Carefully crafted, our tools are durable and make your stone work much easier due to their extraordinary cutting power. The size and form of the chisel is also an important factor to consider when starting a carving or roughing out work. We manufacture a wide range of products so we can offer you every type of chisel that a stonemason might need. Our chisels (and bush hammers) have been the best selling tools amongst Japanese masons and they have proven to be both finely crafted and extremely durable. We hope you will make your work easier and more efficient by using our high quality tools. 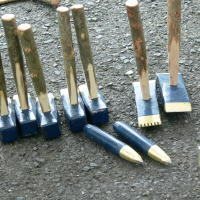 These tools allow you to create a hammered, uneven surface on stone or concrete, resembling a naturally weathered rock. For larger jobs, bush hammers designed for radial arm grinding machines are very popular. However, for smaller areas or situations that lend themselves to working by hand or with an air hammer, our bush hammers are exactly what you need. Our bush hammer chips are made of carbide, just like our chisels, so they are highly durable and can be used on granite, sandstone, concrete, or any other kind of hard stone. The quality of the work accomplished with a bush hammer is dependant on the durability and hardness of the tool because the shape of the hammer's serrated face is transferred directly onto the stone's surface. For a good bush hammered surface, you need a good flat surface to start with. We offer a variety of sizes and segments and various grids of conical or pyramid point heads to meet your exact specifications. Please feel free to contact us and inquire about the details. Make sure to dry and clean the tool before you work. If the part (head of the chisel and hammer) you are going to strike is wet or dirty, even if you strike straight, the force will go off. This process usually require high skill but you also need the skill to "select" the best tool which fit into the situation.